The price list below includes cake pops and cupcakes. For custom cake orders, pricing will depend largely on final design. Cake prices start at $65. We will take all of your information and get back to you with a final price ASAP. On weekends (Friday-Sunday) response times may take 48 hours. We are CLOSED on Mondays & respond to those inquiries the next day. My minimum order is $100 on any and all items, or combinations of items. Delivery is available when the schedule allows. If you need delivery, be sure to request it at the time of your order so that we can best accommodate you. Delivery within Anthem, 85086 is just $5. Delivery fee is $30 per hour outside of Anthem. If you are 30 minutes (one way) from the kitchen, then your total charge will be $30 for the time round trip. On large cakes and tiered cakes, we encourage you to invest in delivery. Once a cake leaves the kitchen, refunds are not given for any or accidental damage after pickup. If you choose to pickup rather than opt for delivery, pickups will be available on Saturdays and Sundays between 9am and 1pm. You will be asked to schedule a 1 hour window for pickup to be sure we are available and not on another order delivery. 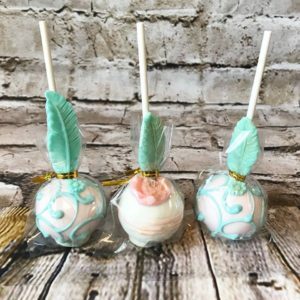 CAKE POPS – cake pops are extremely popular due to their convenience, size and the fact that they are so versatile- cake pops are a decoration, a dessert and a party favor! A cake pop is fully baked cake combined with frosting and formed into a ball or other shape, then placed on a stick and dipped in a chocolate or vanilla shell. Don’t be fooled by their small size, the amount of cake in every pop is about equal to the amount of cake in a cupcake (give or a take a few crumbs). They are adorable and delicious! 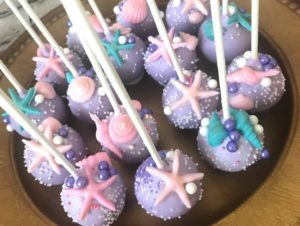 All of our cake pops are custom designed, made to order, and individually wrapped and tied upon request- note: If you would like your cake pops individually wrapped and tied, there will be an additional charge of $3 per dozen. Minimum of 2 dozen cake pops per cake flavor. No exceptions. 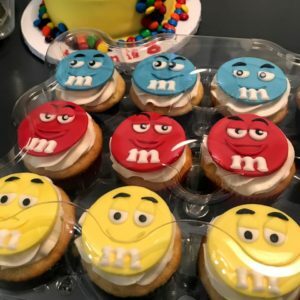 A second cake flavor can be chosen after the 2 dozen minimum. Additional cake pop flavors must be ordered by the dozen as well. Additional fees may be charged for specialty orders, odd numbered orders and specialty flavors. Basic Cake Pops; one cake flavor, dipped in one color only, no design- $30 per dozen – 2 dozen min. Cake Pops with multiple colors (2), stripes or sprinkled; one cake flavor, two colors-start at $33 per dozen- +$3 per additional color, per dozen- 2 dozen min. Fancy signature swirled cake pops– $36 per dozen, includes up to 2 color choices per 2 dozen. $3 per additional color per dozen.- 2 dozen min. Upgraded colors such as gold, silver, bling style $39 per dozen. Cake pops on decorative straws, bling sticks etc will be priced based on added cost of these items. Outside products cannot be used. I will have to order these from my own trusted sources. 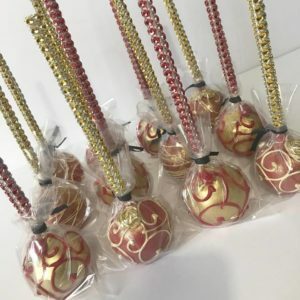 Again, there is a minimum order of 2 dozen cake pops unless you are ordering additional treats such as a cake or cupcakes. No exceptions to the minimum order policy. Gift boxes, buckets, and other displays are available at an additional cost. Please let us know what you are looking for and we will help create the perfect cake pop package to fit your needs! New Policy- If you would like your cake pops individually wrapped and tied, there will be an additional charge of $3 per dozen. I am no longer offering character cake pops that are shaped in any way other than round. These can be themed to match a character, but only round pops will be offered going forward. 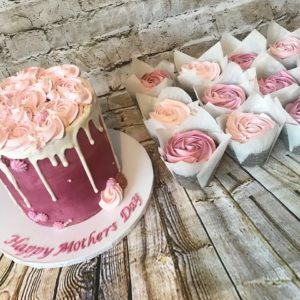 Specialty flavors, fondant designs and other special requests– prices start at $45 per dozen and go up- please call for a quote.